Cake mix isn't just for cake! 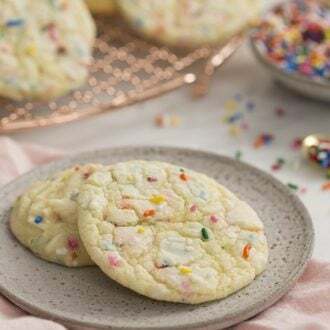 You can make delicious cookies in a snap and add a cascade of sprinkles for extra cheer. Preheat oven to 350F. Sift the cake mix into a large bowl. Whisk together until well combined then fold in sprinkles. Place dollops of the batter, about 2 tablespoons in size, onto a prepared baking sheet. If you don't want to use butter, you can use 1/3 cup of oil instead. I've found the cookies are a bit cakier with oil and spread out less!